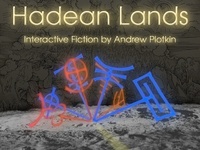 I was going to post here about Hadean Lands, the new game Andrew Plotkin is writing, and how you can contribute via Kickstarter to get this thing fully funded. Contributing is the only way to get yourself a PC/Mac version of the game when it comes out. It’s otherwise going to be released for iOS only. There’s a short, playable trailer available, so you can see for yourself what kind of a thing this is going to be. The more Andrew’s funding goes over minimum, the more time he’ll be able to devote to being a full-time IF author and tool-maker. And that’s important because, in addition to releasing the game, he’s planning to share the tools for other people to release iOS games. If you’re keen to see more accessible IF on more platforms, this is a great way to help make that happen. This entry was posted in announcements, community, Inform 7, interactive fiction and tagged popular by Emily Short. Bookmark the permalink. Since the $25 pledge includes all the stuff you’d get for a $10 pledge, it’s really only a $15 game. If you want to look at it that way. Not that $25 is an unusual amount to pay for a video game, mind. Thanks for the link, Emily! The price issue is pretty much what Emily and Doug have described. On the one hand, this is a $5 iPhone/iPad game and you can pre-order it for $3. I’m confident that that’s fair. It blows my mind that you would purposely limit the game specifically to iDevices in the first place. Maybe I’m missing something, but surely with a release as relatively limited an audience as if, you’d want it available from day one on as many different platforms as possible? Or a new novel in hardcover. Maybe we should start a kickstarter campaign for brian to raise $25. I have no intention of funding development of a game for the iPhone with no certainty of an Android port in the future. Nor I wish to spend 25$ for a now-or-never chance to play an IF on my PC. If these are the only two options for those of us who can live happily without Apple-branded products, I choose neither. Your prerogative, of course, but I’m not in a position to change anything about the reward structure; only to observe that, from my point of view, this is worth doing pretty much regardless of the game itself. Well, brian, about more atractive rewards… well, if Hadean is a game so fascinating as So Far, or Spider and Web, I think it is an awesome reward. Keep in mind that it is more easy to be “awesome” in other mediums as in videogames. And about the android thing… Zarf has explained that he pretends to work too with other mobile platforms, like Android, but, for now, the scope is oriented only at Iphone and derivatives. And as a non-programmer, forgive me for not getting so excited about all the new Glulx developments and browser support when I won’t get to see the actual end results. However, I’ll be happy to fund a project further down the line called “let’s port all this stuff to other platforms”. Better Glulx interpreter support in the browser isn’t “for programmers”. Having those interpreters polished and high-performance mean more games that can be played in a way that’s universally accessible, and more elegant presentations of games that can already be played. I also struggled with the idea of supporting a project that’s going to produce iPhone games: on the one hand I want zarf to succeed at selling commercial IF, but on the other hand 30% of his game sales will go to what I consider one of the most malevolent corporations in existence today. And while I do hope there’s an Android/Kindle port, for that to happen I expect it’ll take a lot of collaboration between zarf and the folks who are already working on Glulx for Android/Kindle. Ditto Stephen: it’s the improved Glulx support I’m angling for here. The game is just gravy. I’m a little bit disappointed that there won’t be a PC/Mac release outside the bounds of Kickstarter. That wasn’t really my understanding from reading the Kickstarter page — I thought that it was only the special limited edition for PC/Mac that would be Kickstarter only, which wouldn’t preclude an unlimited desktop edition later on? Am I wrong in this? If not then I won’t be contributing as I see a dark future in which nobody is willing to distribute outside corporate-controlled islands like the iOS and while I don’t begrudge anyone their favouritisms (I’m a Mac user myself) I still wouldn’t wish to fund that kind of exclusivity that contributes to what I believe will become a serious cultural problem of ‘the new gatekeepers’ before too long. So: the portable file is something he can release now; it’s not sensibly “priced” at $25, but is a reward. But, as that’s too ambitious for the initial offering and polishing a desktop product is a separate task, he’s not *committing* to produce marketable editions for every platform right now. Sounds fair and like it answered my concerns, albeit somewhat obliquely (I am not against the portable game and I am not against the $25 price point — the only thing that gave me pause was the idea having a desktop version but not releasing it, in favour of a corporately curated space). I read the whole thread and did not pick up on the info in your final paragraph — thanks for bringing it to my attention.